The wait is over, after a long process of trial and error, I have finally finished my Warlok Robes Sets. 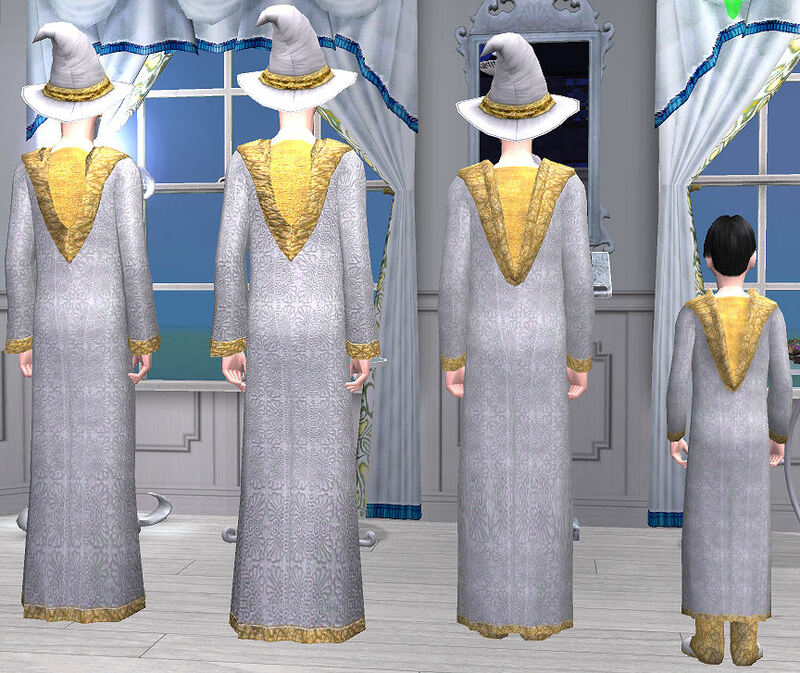 The robes are made to match the Maxis warlok hat hair, but they also go great with my witch dress sets. These outfit will look good on you elven or medieval sims too. The good warloks wear a light teal under robe, with an embroidered white hooded over robe that has crackled gold trim. The robe is closed with a belt that has a teal jeweled gold brooch. The pictures really doesn't do them complete justice, they look soooo much better in game. The oufits are for all ages except toddlers which I may make later if people want them. 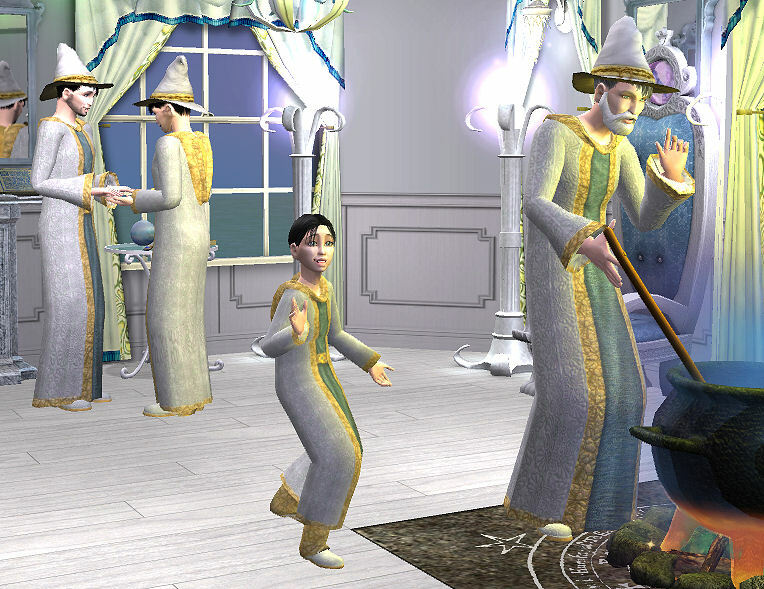 Now your whole sim family can look simply magical. The GoodWarlok.rar works for Elder, Adult, and Young Adult. Young adult is not pictured because it is exactly the same as the adult one. The mesh for it is MESH_besen_amnachthemd121005 by Besen which you can find here on MTS2 as part of the Dark Project. It can be found under post #4 (Medieval Men) in the DP-Men-WizPrince.rar. The meshes for the Teen_GoodWarlok.rar and Child_GoodWarlok.rar are by Mia86 and are not included, but you can find them here on MTS2 as well. The outfits work in the Everyday, Formal, and Outerwear sections (because after all, it is a robe). I am pretty sure that they are all basegame compatible, but if it does not work for people with the basegame please let me know. 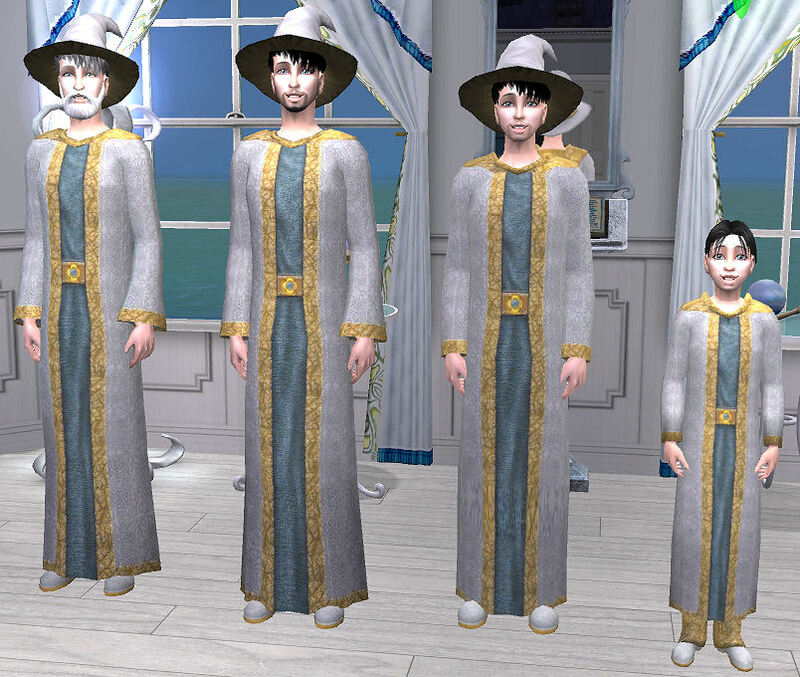 As with my witches gown sets, these are not default replacements for your warlok outfits. If your alignment changes, you will have to re-set it as your outfit. If anyone wants to make them default replacements be my guest, I really don't know how to. The warlok hat hair only works for everyday, all other clothing sections you get a weird maxis replacement that usually doesn't look good. For example, the dark hair teen gets cornrowns for all the other categories, how strange. If you want to avoid this effect you can download Tashafaun's Witch Hat Hair Edit, which will make both the witch hair and the warlok hair work in all categories. That way you can still have the hat when you wear my lovely robes outside on the cold days. Gi-Normous thanks to Besen and Mia86 for creating the meshes and allowing people to recolor them. 565 people have said thanks to Serena_Moonstone for this download.